ThirdRail7 wrote: Wait a minute, ladies and gentlemen. I argue that the whole premise of your thread is wrong, and that it should probably be locked. Is the name relatively dormant after registration? Clustered posting in a relatively short time in similar threads? Overly opinionated without have a firm grasp of the details? It is possible I'm mistaken, but I believe we've seen this show before in the form of PenseyGG1, CTRailfan and NHAirline. This is only a theory that happens to fit the facts but if you use my check list and compare it to the names listed above, you'll find they follow the same pattern. the early attempts of the K-M Hydro,Leyland(railbus),and others. IF 1919 proves that the Cummins prime mover is a reliable,and stable in a RR use,fine. If it turns into a shop queen,then Siemens rolled snake eyes and went bust. Fan Railer wrote: Fact check: both engine manufacturers are American companies... aside from the stipulation that high speed diesels have yet to fully prove themselves in the rail application. So far, I have not heard any major problems from the CAT engines in the ALP-45DPs running for NJT, nor have I heard of any major problem with the CAT engines running in the NS PR43C. Cummins has not seen any major rail action here as far as I know, but I don't doubt their ability to perform in the long run considering their track record in other applications. Not sure what you mean by saying that 'high speed diesels have yet to fully prove themselves in the rail application'? There's been plenty, but maybe not in the US. Look at the Paxman Valenta in the UK Intercity 125, averaging 220 thousand miles a year for 20 years. Cummins engines have been used successfully for about 10 years now in the British class 220/221/222 DEMUs. Now these are far smaller lumps than would be installed in a loco, they do prove that Cummins can produce rail use engines. German RR uses the MTU/Detroit 12/4000 and 16/4000 in many of its locomotives. dowlingm wrote: What is this "I hope they fail" nonsense. If anything this should make EMD and GE being forward better offerings in specification and pricing terms - EMD has made an F125 sale which means there will be a running locomotive to compare vs the Charger. Also Siemens assemble in California rather than a race to the bottom state which cares little for advancing passenger rail (Indiana). That said, Cummins are placing a big bet here, having already had to substitute on Metrolinx' MP40 repower. Given their importance to rail (in the DMU space particularly) and non-rail transit engines a bad outcome for this contract could have significant wider implications. I'd be careful here - Cummins is mostly made in Indiana as well. Further, although Indiana isn't a big Amtrak state, they have been funding passenger rail since the 1970's in a big way. It would be pretty easy for the state to justify abandonment of South Shore trains to South Bend at 2-3x/day and complete de-electrification due to low density, but they open the wallet every year consistently. Tadman wrote: I'd be careful here - Cummins is mostly made in Indiana as well. Further, although Indiana isn't a big Amtrak state, they have been funding passenger rail since the 1970's in a big way. It would be pretty easy for the state to justify abandonment of South Shore trains to South Bend at 2-3x/day and complete de-electrification due to low density, but they open the wallet every year consistently. Look, you got Siemens, one of the biggest names in German engineering after Mr. Robert Bosch himself working with Cummins, which has the huge reputiation of building a very reliable diesel engine. I'm sure the two of them can build a locomotive that is freaking awesome just fine...other wise, i'm sure there will be plenty of more "Cummins-Siemens" jokes aikn to the ones about PowerStroke engines....get my drift? with that series of engine. The "power stroke" pick up truck engine was bad news as well. Can you clarify what you mean by "DMU"? To my knowledge there are no current manufacturers, just the one rebuilder in CAN. Jeff Smith wrote: Can you clarify what you mean by "DMU"? To my knowledge there are no current manufacturers, just the one rebuilder in CAN. Siemens, Stadler, Nippon Sharyo, Bombardier, and Alstom make DMUs. All have compete for business in North America recently. Siemens at North County Transit in San Diego, Stadler with Bay Area Rapid Transit, CapMetro and Denton County Transit, Nippon Sharyo with Sonoma Marin Area Transit and GO Transit in Toronto, Bombardier and Alstom with Ottawa's O Train. Colorado Railcar went out f business, but they had made DMUs for TriMet in Portland, TriRail in Miami, and one for Alaska Railroad. So, there are plenty of manufacturers of DMUs - and many North American transit agencies using DMUs. Off hand, one would have thought the site administrator at Railroad.net would have known about DMUs. ?? ?? Maybe you should go on a rail fan trip and ride every DMU in North America. It'll be a great excuse to get out of the office. So what sort of Illinois-built, Indiana-powered DMU is now available? I haven't of any such vehicle being built or even ordered by a U.S. train operator. CHTT1 wrote: So what sort of Illinois-built, Indiana-powered DMU is now available? I haven't of any such vehicle being built or even ordered by a U.S. train operator. 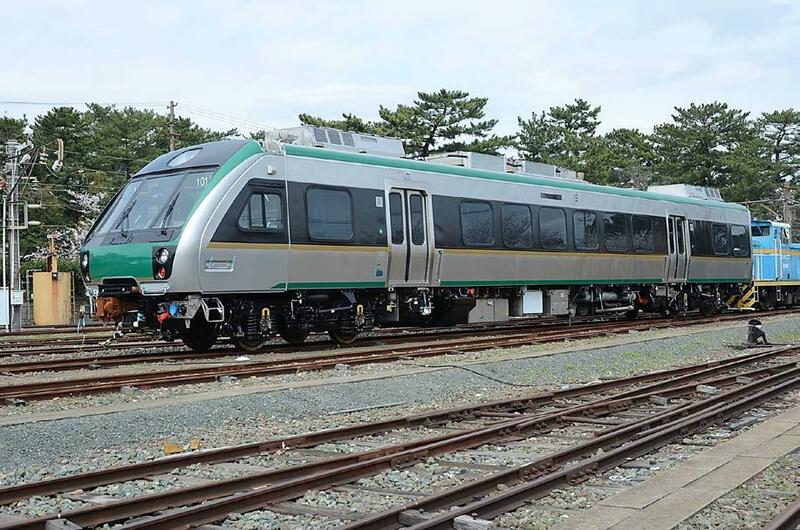 Nippon Sharyo is building FRA compliant DMUs in Rochelle, Illinois for SMART in Northern California and for GO (Union Pearson Express) in Toronto. Here 's a link to a photo of the first SMART prototype built in Japan - it will be disassembled, shipped to, and reassembled in Illinois. SMART will operate these DMUs in married pairs, two units placed back to back. GO (UP) will operate these DMUs in triplets, a married pair with a third unit placed in the middle. All the units will have their final assembly in Illinois with sufficient American parts to qualify for the "Built in America" standard. For more info, check out the SMART and GO threads under the Passenger Rail General forum. There are more passenger trains in America than just Amtrak, believe it or not. Ok, I didn't know that. We'll see how these work out in commuter service. I suppose they could be modified for intercity service. The comment came out of theblue in a topic devoted to the Siemens locomotives. Electricron has summarised it nicely. Trimet WES just ordered 2 cars to reinforce their Colorado units. Because Sumitomo are involved as well the DMUs can sometimes be referred as such rather than NS. My reference up thread was to the Siemens Desiros (MTU engine) operating on the NCTD SPRINTER service under temporal separation.